You know the scene: You’re at the store and considering a healthful stir-fry so you head to the aisle with rice vinegar, tamari, etc. Then suddenly you can’t remember if you already have some of these ingredients at home. As you try to mentally file through your cupboard, only one thought clouds your thinking, which is that if you don’t have it at home then you will be quite annoyed later when you’re trying to quickly get dinner on the table. So you purchase the items…and then return home to put them in the pantry by the other bottles of rice vinegar, tamari, etc. Bam! Seven or so dollars you didn’t need to spend. The key is to review your kitchen and pantry before heading to the store so that you don’t spend money on ingredients you already have and so that you’ll also increase the chance that those ingredients will be used before they expire. Pick ingredients that do double duty. It’s not uncommon to purchase a bunch or parsley and only need two tablespoons or open a carton of chicken broth and use one cup. The usual next step is for those ingredients to be pushed toward the back of your refrigerator where they can be forgotten until your next fridge clean out. Save money by finding recipes that allow your ingredients to be used for more than one recipe. Take this a step further by purchasing some foods in more affordable, bulk packaging so that you can save money and time. For example, use ground turkey for today’s tacos and tomorrow’s Korean bibimbap. Create your own perfect package. Avoid expensive, individual packaged foods and you’ll be doing something good for your wallet and the environment. Instead, create your own small portions of food using reusable bags and containers. Or consider a different approach and swing by the bulk section of your market to buy just what you need for the recipe you’re making, especially if you’re trying a new grain or seed and aren’t sure how it will be received at home. Know the cost of a calorie. Consider targeting your shopping to highlight nutrient-dense foods. Eliminate the products that provide empty calories, sugar, or other negative attributes that we’re trying to avoid in our diet. If we shop for foods that keep us fuller longer and are rich in a variety of nutrients, we simply need less to stay full. Needing less means buying less, which saves money. What does this shopping list look like? It’s complete with lean proteins like chicken and passes on the bottled juice, sugary snacks, and convenience items that aren’t created the way you would make them and cost more than preparing on your own. It’s only a good deal if you need it. This is tried and true advice, but it’s not just about asking if yourself if it’s worth buying extra of something just to save, it’s about asking yourself if you nutritionally need it. When you’re creating your shopping list and filling your cart, it should represent your nutrition goals. 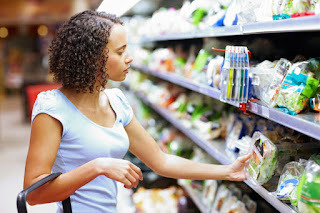 Skip past the aisles packed with foods that don’t align with those goals. You’ll save money for sure and, even better, have money to spend on the foods that do keep you on your wellness path. About Guiding Stars: Guiding Stars is a nutritional guidance program that can be found within Giant Food, Hannaford, Stop&Shop and other major grocery stores. As you go through each aisle of the store or navigate through your cafeteria, the Guiding Stars program can help you identify more nutritious choices. Guiding Stars rates the nutritional quality of food using information from the Nutrition Facts Panel and the ingredients list. Foods are rated and receive a score. Guiding Stars is not intended to tell you what to buy, but rather point you toward foods that have more vitamins, minerals, dietary fiber, whole grains, and omega 3 fatty acids –and less saturated and trans fats, added sugar and sodium, and artificial colors.